LiveAction's email designs and templates are constantly being iterated through conducting A/B testing and analyzing open rates, click-through rates (CTRs), and contacts lost. We want our emails to be fresh and relatable to our current pool of prospects, customers, and other audience members. clean formatting, and better scanability. I host an open mic webinar every Thursday that covers subjects such as Wide Area Networking Monitoring (WAN), Voice over IP (VoIP), Quality of Service (QoS), and Application Performance Monitoring (APM). After each webinar, a follow-up email is sent to all registrants and attendees, thanking them for their interest. However, when I first started working at LiveAction, I noticed that generic follow-up emails from the webinar-hosted platform (WebEx and, now, GoToWebinar) were sent to customers as opposed to our own emails that we could have more control over. I took the intiative to create our own LiveAction emails, as displayed below. The first one (far left) illustrates a generic GoToWebinar follow-up email; the middle email illustrates an already existing template that I re-purposed, and the final email (far right) illustrates a follow-up email that I recreated and redesigned. 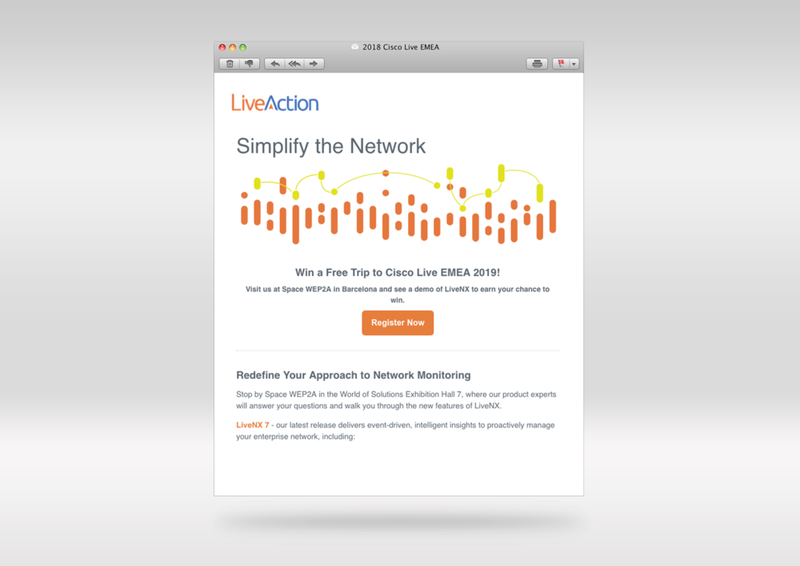 These emails promote a series of trade shows that we annually attend, Cisco Live. The following images illustrate the different templates that were utilized for these trade shows throughout the past year. While I did not design the templates for the first two (far left and middle), I designed the final template and design (far right) for Cisco Live EMEA 2018 that will also be used for the upcoming trade shows such as RSA 2018.